"L'éclipse de lune de Christophe Colomb." 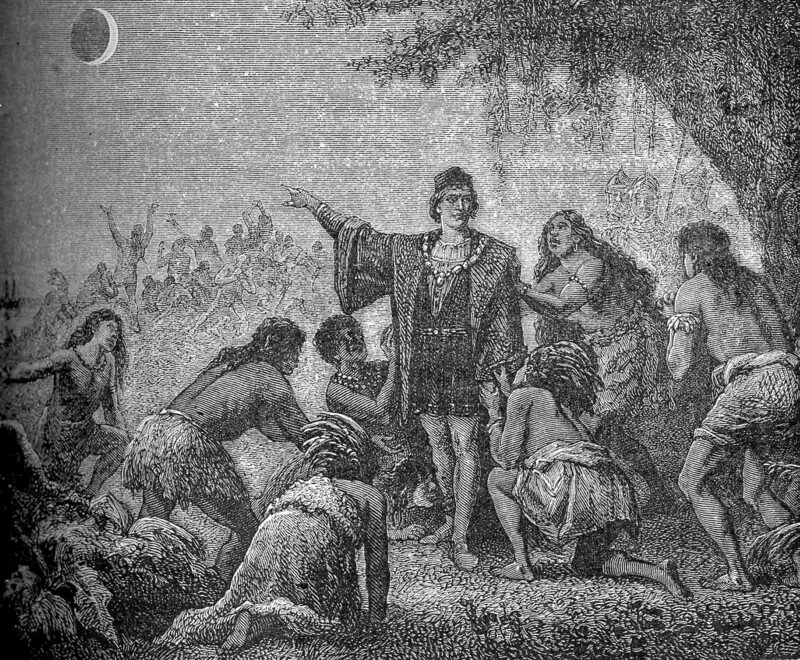 Columbus impressing local Jamaicans by foretelling the June 30, 1503 lunar eclipse. * The word "eclipse" comes from the Greek ekleipsis, meaning "omission" or "failure," that is, something gone wrong. It's cognate with "ellipse" and with "ellipsis," those quaint periods ... found in novels where something (usually racy) is omitted. * The moon's orbit is tilted about five degrees with respect to the ecliptic, the plane of Earth's orbit around the sun. If it were in the same plane, we'd experience a lunar eclipse every full moon and either a total or annular solar eclipse every new moon. * In a lifetime of "three score years and ten," a person living in the same location could expect to see about 50 lunar eclipses -- half being total -- and 30 partial solar eclipses. However, that person would only have a 20 percent chance of seeing a total solar eclipse. * The longest possible duration of a total solar eclipse is 7 minutes 40 seconds, while the maximum total lunar eclipse lasts 1 hour 44 minutes. * People have been noting eclipses for a long time. Writing in the second century CE, the Greek astronomer Ptolemy discusses Babylonian eclipse records going back to 747 B.C. * According to Herodotus, Thales of Miletus predicted the eclipse of May 28, 585 BCE. He probably did so using the "saros" cycle discovered by the Babylonians, a mathematical coincidence that results in approximately the same configuration of sun, moon and Earth every 18 years 11 days 8 hours (ignoring leap years). * That 585 BCE eclipse gives us the first definitive date for a historical event, in this case, the end of a war. The Lydians and Medes were in the middle of a battle when (again according to Herodotus) "... the day was suddenly turned to night ... so they ceased from fighting, and both parties were the more zealous to make peace." * The ancient Chinese attributed the fortunes of the emperor and his family to eclipses. The Han Dynasty record for the total solar eclipse of Jan. 18, 120 CE includes the commentary, "Teng, the Empress Dowager, showed aversion to it. Two years and three months later, she died." * The length of the day is increasing by nearly two milliseconds per century, mainly due to the braking effect of tides (Field Notes, Jan. 6, 2011). Ancient eclipse records help astronomers calculate how fast Earth is slowing, because if the length of the day were constant, you would have had to be 2,500 miles west of Babylon to see the total solar eclipse of April 15, 136 BCE. But according to a clay tablet from Babylon, now in the British Museum, "24 us (96 minutes) after sunrise, a solar eclipse obscured the sun on the southwest side ... Venus and Mercury were visible." That 2,500 miles "lost" over 21 centuries gives the average rate of slowing. As Barry Evans' (barryevans9@yahoo.com) emerged many years ago from the Imam Reza mosque in Mashad, Iran (one of the three holiest Shia shrines), the moon had magically turned to copper: a total lunar eclipse.